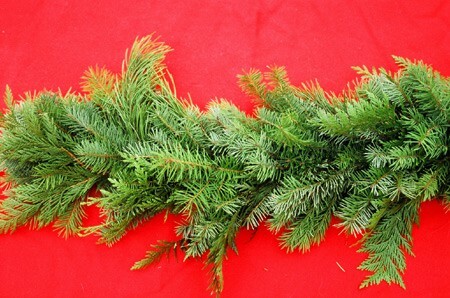 Our Basic Garland can be made to order and is created using boughs of Douglas fir (Pseudotsuga menziesii) wrapped onto a twine. The average length for a door entrance is 18′ but they can be used in many different places to accent your home. Some ideas are for lamp posts, railings, pillars, verandas, staircases and mantles. The natural scent will last into the spring in cool climates but they can also be located inside. CODE: GB, $3.40 / foot (minimum 10 feet).